After one thousand years, his journey begins. Return to a galaxy not mired by politics, complicated plotting, and unfunny CGI characters. 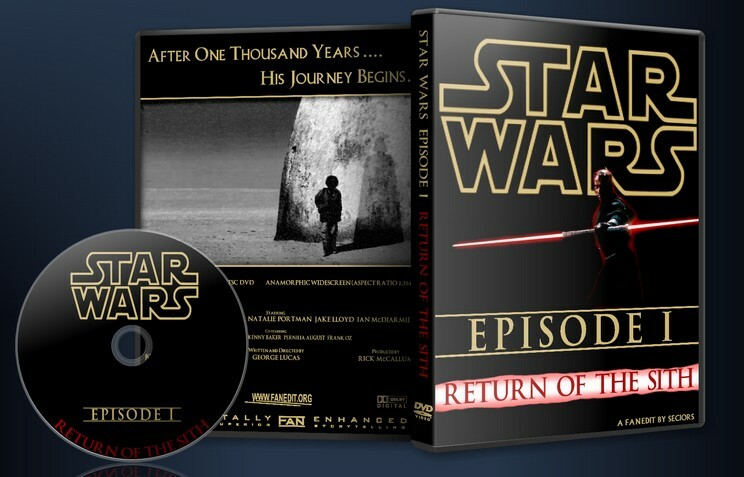 Return of the Sith is as close to the spirit of the Original Trilogy as possible. Simplify the story to make it an exciting and entertaining introduction to Anakin Skywalker and the Jedi at the peak of the Republic. I also plan to keep the identity of the Emperor secret until Episode III, to make the Sith and their presence more mysterious and menacing. Thanks JP87 for reviewing my work print, and all the feedback people gave me in my “in the works” thread. - Lord Sidious does not appear in the movie. The Federation has apparently acted on their own accord in trying to take over Naboo. - Neimodian dialog trimmed down to make them more threatening and less dumb/scared. - Battle droids do not talk. - Jar-Jar’s lines and antics are extremely cut down throughout the movie. Basically, if it could be cut without affecting the plot or damaging the visual/audio, it has been cut. - Trip to the underwater Gungan City is completely cut. There is only one plot-point for thi scene, and it is to have a reason why Jar-Jar sticks around for the rest of the movie. I have tried to accomplish this using Jar-Jar’s declaration of being Qui-Gon’s servant, as well as keeping a trimmed down version of the Padme-cleaning-R2 scene where she point blank asks him what are you doing here? - Dialog outside the hangar no longer includes boring talk of treaties, legalized invasions, and the senate. - No scene where R2 gets commended by the “queen” and then orders the real queen to clean him up. (nice.) This also gets rid of the redundant dialog of declaring they are going to tatooine. - Darth Maul lands on tatooine directly after the Jedi do, which is also at night. - “No more commands from Her Highness today” cut. I don’t recall any commands, so I find the line nonsensical. - No Jar-Jar antics in Watto’s shop. - No ‘yipee’s from Anakin. - Reinstated the Anakin Fights Greedo deleted scene, but placed it after Qui-Gon talks to Obi-Wan over the transmitter regarding what assets they have left. The scene replaces the whole Jar-Jar trying to eat the chicken sequence. - “He’s a protocol droid to help Mom.” Help Mom do what, exactly? Deleted. - Trimmed dinner scene at Anakin’s home. Beyond removing Jar-Jar antics, I’ve made the discussion about Anakin entering the pod race just between him and his mother, without interjections from padme and Qui-Gon. - Removed the group of kids, and Jar-Jar antics from the starting-up-the-pod scene. - Pod Race announcers are not shown onscreen. Some commentary can still be heard, where appropriate, to maintain the “we-are-watching-a-sports-TV-event” feeling. - Sebulba doesn’t sabotage Anakin’s pod, and their pre-race meeting is cut. - Pod race is significantly shortened. No introductions, and no Anakin “spinning out of control” sequence. The action only follows Anakin and not the other racers. - Qui-Gon saying “Will you be all right?” Like, what is she going to say to that? - When saying goodbye to his mother, he doesn’t say “I can’t do it, Mom. I just can’t do it.” He also doesn’t say he will come back to free his Mom. The scene is much stronger without these lines. - Reinstated the Goodbye to Jira / Probe Droid scene, which leads directly to them running to the ship. So the Probe Droid talking to Darth Maul scene is cut. - “Qui-Gon, sir, wait! I’m tired!” So he runs all that way and within 50 feet of the ship he decides to ask to take a break? Cut. - “Tell them to take off!” – Anakin doesn’t do it, and Obi-Wan tells them to take off as if he thought of it himself, so why keep it. - “My guess is it was after the queen.” Cut this to help keep the focus on Maul/Sith vs the Jedi. - Trimmed scene where Anakin gives Padme the necklace; removed some of Jar-Jar’s muttering, as well as some of the political talk of the senate. Also removed “japor snippet” as if the audience would actually understand that. Finally, removed Ani’s “I care for you too, only I…” and Padme’s response. Now the scene ends on Padme telling Anakin her caring for him will remain. - Trimmed Queen/Palpatine scene to tone down the politics, and also tone down Palpatine’s obvious push for the Queen to oust the Chancellor. - Removed scene where Anakin looks for Padme to say goodbye before “his training.” The scene serves no purpose and slows things down. - In the senate, removed as much of the political jargon/dialog as possible. Palpatine simply introduces the Queen, and the Queen is quickly interrupted. We do not see Palpatine talking to the Queen; instead we only see the Queen until the Chancellor asks her to defer. Now it is the Queen by herself that reacts and decides to call for the no confidence vote. Finally, we don’t see Palpatine after that, talking of a new Chancellor to be elected. This all makes the scene much more focused on the Queen and makes her stronger, I think. - Cut mention that Anakin is too old. Luke wasn’t, so Anakin isn’t either. - Cut Qui-Gon saying to Obi “You still have much to learn” seeing as moments later he says Obi is ready for the trials, and even later tells him he is much wiser then Qui-gon. - Trimmed scene where we find out Palpatine has been nominated; the Queen does not ask who else has been nominated but goes right to telling Palpatine she has decided to return to Naboo. - Removed the hint of a smile by Palpatine during the transition to the Jedi Temple. - Removed line about the Federation will arrest the Queen and force her to sign the treaty. - Removed line about the Jedi not being able to use their power to help. What does that mean, of course they use their powers all the time. I guess they can’t if it interferes with George’s scripting. - Jar Jar doesn’t come out of the lake. So we never really know where the Gungan city is. - Removed Boss Nass bringing up that the Naboo think they are better than the Gungans. - The planning scene is trimmed; Boss Nass doesn’t make Jar-Jar a General. - When the battle begins, we see the Federation approach before the Gungans stop and put up their shield. - We don’t see the droids activated from the space ship, they just become activated. - No “ouch time” line. - All Jar-Jar silliness is excised from the battle. - “My guess is the Viceroy’s in the throne room” – already said during planning. - Anakin silently decides to activate his ship, shoot the destroyers, and take off into space. There’s also no autopilot. - The battle sequence is rearranged to not jump around the three locations as much. 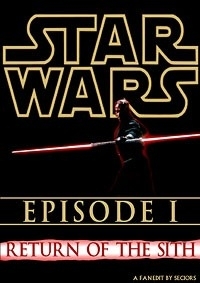 - Once everyone is captured, the sequence is simplified so that we first see the Queen capture the Viceroy, then we see Anakin enter/destroy the droid command ship, and finally we see the rest of the Jedi battle with Maul, starting with the first time they are trapped in the force field. - Obi-Wan’s killing of Maul is faster, so it doesn’t appear like Maul just waits to be killed. - Qui-Gon doesn’t speak to Obi at the end…he is already dead. - After all the battles, we don’t have the discussion with the Viceroy about explaining things to the Senate, and kissing their trade franchise goodbye. - During the funeral, Yoda doesn’t say “no more, no less” about the number of Sith. - The ending celebration is greatly trimmed down; we don’t see Jar-Jar doing any of the silly activities, nor do we see the Gungans waving to the crowd, either from the animals or walking up the steps. Boss Nass doesn’t yell out nor does Jar-Jar. My first fan edit review!!! Having spent a lot of time editing The Phantom Menace myself (work in progress), I can really appreciate the technical difficulty of this very aggressive edit. The transitions were excellent between scenes, particularly the audio. Overall it was a technically excellent edit. There were some transitions that were obvious, but overall they were seamless. A very bold move to completely edit out the Gungan home world, something I hadn't considered doing, but it worked really well. I really enjoyed the pod race sequence, which is ridiculously long in the original release. Your edit is seamless, well paced and the perfect duration. You made an excellent job of making the Neimodians a more menacing threat. I loved the absence of Sidious. I'm still not sure whether I prefer it to the original, but its a very interesting take on the film. Excellent job on editing out all Battle Droid dialogue. Superb final battle sequence.... no Jar Jar antics and your cut of Anakin destroying the droid control ship was excellent. The cut is slightly too aggressive for my liking, and some parts of the film, particularly the opening 20 minutes, seem very rushed. I didn't feel any added tension from your recut of the Tatooine sequences. I never felt that our heroes were in any more danger than the original film.